I stuck a bit of memory wire in there to make it hold it's shape, and it didn't want to stay. I could have (should have) made a loop on the end of the wire so it couldn't stick out but was advised that it would still stick out (and break beads in the process) even if I did that. That's because the memory wire's circumference is smaller than the bangle so it won't stretch out like it needs to. What to do? 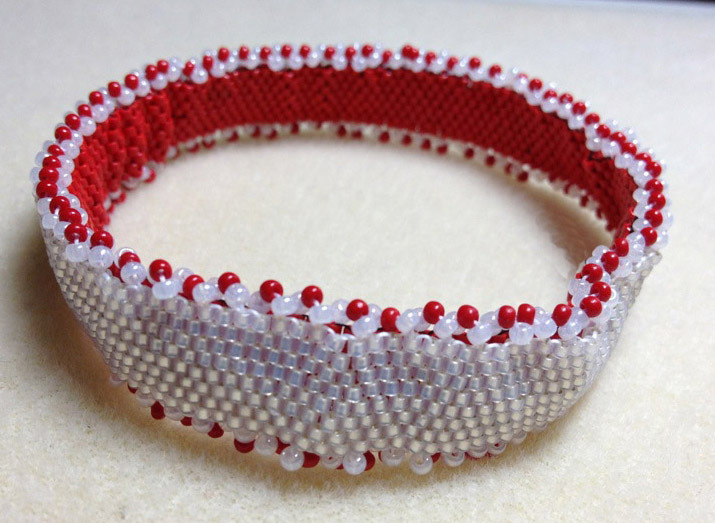 I searched the internets for bracelet blanks and only found one place that had what I need. It's here at Metalliferous.com. And wouldn't you know the size I need is out of stock. 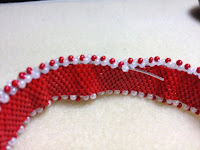 So this red & white failure will be taken apart (at least one picot edge will come off) and will await further research. I'm thinking of buying cheap bangles and using one of those inside. What do you think? Any reason not to do that? And here's something wonderful! 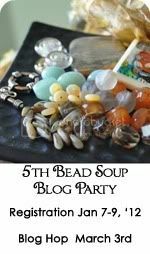 Carol Dean Sharp (one of the nicest people in the beading world) is having a giveaway at Sand Fibers blog. Go here but don't win, ok? I don't know about you but I have a small box with my failed creations which need to be taken apart and the beads reused! We have to fail sometimes in order to improve! Oh yeah, my friend, I have a whole pile of failures, didn't likes, didn't like enough to finish it, etc. I'm kinda wondering if something like a piece of cardboard would work. Or the Lacey's stiff stuff they use for bead embroidery. 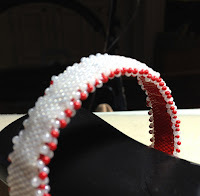 You don't need it for the structure, just to make the bangle smooth, right? Shirley may have a great idea about using the Lacey Stiff Stuff. It may give you the firm foundation you're looking for and you know it is not going to poke through the beads. Gosh, I think your cuff looks mind boggling! It is so pretty, I can't imagine that it did'n't work out. 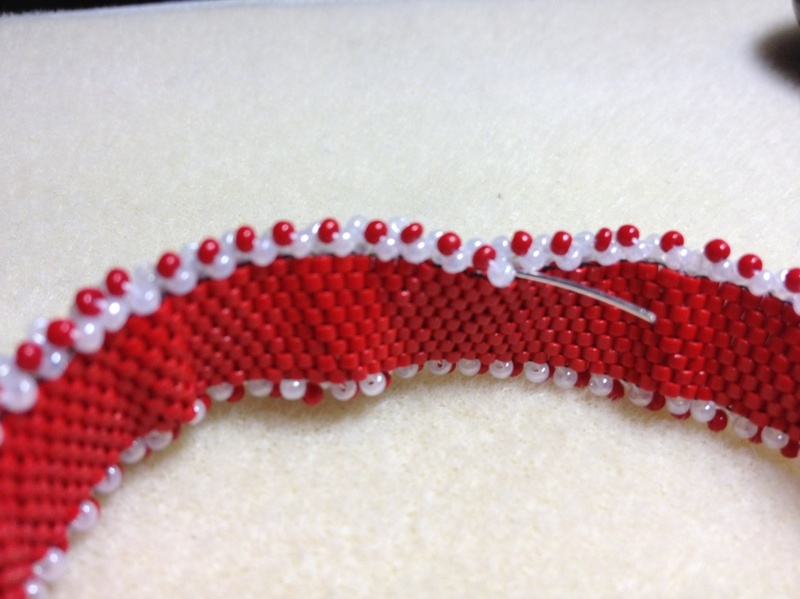 But you know the seed beads are completely in another league to me! Your cuff is so pretty though in the red & white - perfect for Valentine's.